Four bite-sized lessons focus on techniques guitarists can put into practice right away. For around a dollar a day, Gilbert’s students get nearly 200 pre-recorded lessons, plus the ability to submit practice videos to Paul and get video feedback. ArtistWorks, the leading interactive lifestyle social learning platform, today announced the release of a free lesson pack from its rock guitar teacher Paul Gilbert. The four lessons were culled from dozens of 2013 “Welcome Messages” Gilbert posts regularly in his ArtistWorks’ Online Rock Guitar School. Gilbert regularly welcomes new members via video and includes bonus guitar lessons for all the members to learn from. Neal Schon Riff: Paul teaches his favorite riff by Journey guitarist Neal Schon, this one influenced Paul early on when he was first learning guitar! Interval Blues Lick: Paul analyzes a new "bonus" blues guitar lick inspired by fellow ArtistWorks guitar teacher Martin Taylor! Mixolydian Lick: Paul shows a cool mixolydian lick that he came up with, six notes! E Minor Lick: Paul breaks down one of his favorite guitar lick based around the E Minor progression a la Gary Moore. For around a dollar a day, Gilbert’s students get nearly 200 pre-recorded lessons, plus the ability to submit practice videos to Paul and get video feedback from the master himself. These Video Exchanges™ are paired together on the site and made available for all members to learn from. Since launching the school in July 2012, Gilbert has recorded well over 1,500 Video Exchange lessons. In addition to the hundreds of online guitar lessons he pre-recorded for the school, and the 1500-plus Video Exchange lessons he continually records, Gilbert still finds time to add more lessons in his weekly welcome messages! That’s a man who loves guitar and loves to teach. The Online Rock Guitar School with Paul Gilbert costs $90 for three months, $150 for six months or $240 for six months unlimited access. 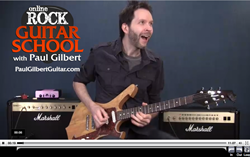 To access the new Paul Gilbert Bonus Lesson Pack, click here. For more information on the Online Rock Guitar School with Paul Gilbert, visit PaulGilbertGuitar.com. In 2008, former AOL executive David Butler set out to finally master jazz guitar. With no acceptable teachers in his area, he built a revolutionary online system to enable anyone to get direct feedback from a master teacher anywhere in the world. Today, ArtistWorks, Inc. is the leader in a new generation of online learning platforms. This “next generation” Video Exchange™ Feedback Platform enables world renowned artists and musicians to "teach the world" by presenting their artistic legacy in the form of HD video lessons and direct feedback to subscribing students. Utilizing simple web cams, smartphones, tablets or video cameras, students are able to submit practice videos and get individualized video feedback and guidance from their teaching artists - creating a constantly evolving two-way, online learning experience. ArtistWorks currently offers schools from such world-class artists as: Paul Gilbert (rock guitar lessons), Martin Taylor (fingerstyle guitar lessons), Jason Vieaux (classical guitar lessons), Chuck Loeb (jazz guitar lessons - coming soon), Nathan East (electric bass lessons), John Patitucci (jazz bass lessons), Andreas Oberg (jazz guitar lessons), Jeannie Deva (singing lessons), Nathan Cole (violin lessons), Jeffrey Khaner (flute lessons), William Caballero (French horn lessons), David Bilger (trumpet lessons), Ricardo Morales (clarinet lessons), Howard Levy (harmonica lessons), DJ Qbert (DJ lessons), Christie Peery (piano lessons), Luis Conte (percussion lessons), as well as the ArtistWorks Academy of Bluegrass with Tony Trischka (banjo lessons), Missy Raines (double bass lessons), Bryan Sutton (flatpick guitar lessons), Andy Hall (Dobro lessons), Mike Marshall (mandolin lessons), Darol Anger (fiddle lessons), Free Acoustic Guitar Lessons with Scott Law, and Justin BUA (art lessons). For more information, visit ArtistWorks.com.